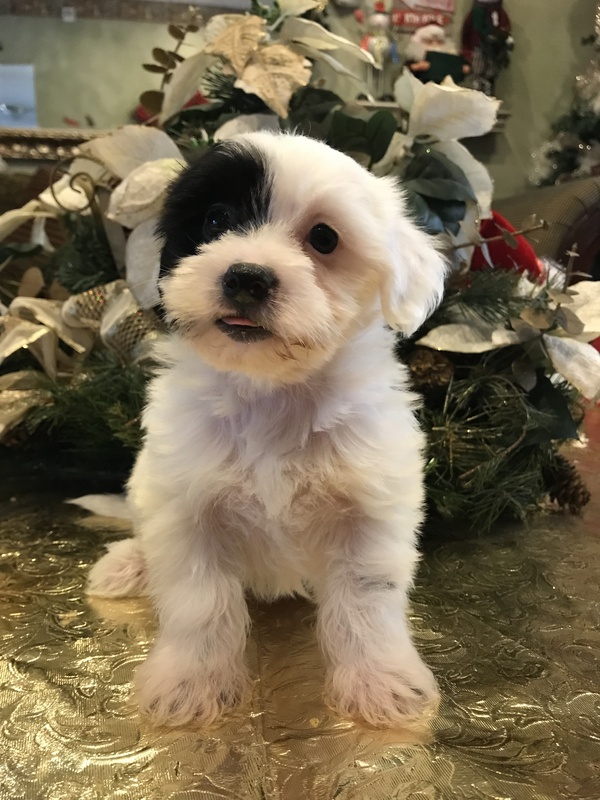 Gorgeous Shorkipoo Puppies If you see one you love and it says STILL AVAILABLE scroll past past the puppies till you come to their page to learn more about them. Sasha Female CKC Shorkipoo $1750 Ready 1/15 SOLD MY NEW HOME JACKSONVILLE, FL 1.8 lbs 6W4D Old! SOLD! Sassy Black & White Female CKC Shorkipoo Is Ready To Give You A Lifetime Of Love!! “Hello everyone, my name is Sassy and I am looking for my new family. I love to play with my brothers and sisters, and get lots of attention and also I like to give kisses!” I love to run around the house and chase you. I have a beautiful baby doll face, and a full coat of hair. I’ll come to you with a lifetime of puppy kisses. Just pick up the phone and say I want to make Sassy mine! Waiting on my new name and my new home is Neptune Beach, FL. She is a Gorgeous black and white color. She has the most white on her tail that will make you giggle when she wag it. She is one of three girls in this litter of five Her adult weight estimated 10 lbs..
SOLD! Scooter Cutest Male CKC Shorkipoo So Adorable You Can’t Resist Him! Scooter is a spunky little fella. He likes to play, but is also very sweet and cuddle. He’s well socialized around other dogs and people. His affectionate nature is contagious and soon you will find yourself rolling around on the ground with this puppy being covered in puppy kisses. Scooter will arrive to you with a lifetime of puppy kisses. Make him your new best friend.. Waiting on my new name and my new home is Sacramento, CA. He is an absolutely Gorgeous White color with black on his one eye and ear making him such a cutie. Oh don’t forget my adorable full tail that will make you giggle when I wag it. He is one of two boys in this litter of five His adult weight estimated 10 lbs..
SOLD! Selina Gorgeous Gold Female CKC Shorkipoo A Real Beauty! Selina is a beautiful golden female Shorkipoo. She is very gentle and fun loving. She is the very cutest pup you will find on the block. She will bring lots of laughs and smiles to all. Just make her yours today and I will get her coming your way very soon. She will shower you with puppy kisses and be your forever friend. She is very healthy and all her vaccinations are current. Waiting on my new name and my new home is Albany, CA . She is an absolutely Gorgeous gold color. Oh don’t forget her adorable full tail that will make you giggle when I wag it. She is one of three girls in this litter of five Her adult weight estimated 10 lbs..
SOLD! Shadow Gorgeous Black Male CKC Shorkipoo Is Ready To Give You A Lifetime Of Love!! Rev up your engines! Shadow is his name and playing is his game! This playful boy can’t wait to go on adventures with you. Just picture it now: running through the park, playing fetch, swimming, and so much more! Shadow is the best of both worlds with his good looks and loving personality. Don’t let him get away. He’s a great guy looking for a great family like yours. Once he’s with you, you’ll wonder how you got along without him. Waiting on my new name and my new home is St Augustine, FL. He is an absolutely Gorgeous black color. She has the most black . Oh don’t forget my adorable full tail that will make you giggle when I wag it. He is one of two boys in this litter of five His adult weight estimated 10 lbs..
SOLD! Sasha Black & White Female CKC Shorkipoo Is Ready To Give You A Lifetime Of Love!! She is absolutely just look at her Gorgeous black and white color. She has the most black . Oh don’t forget my adorable full tail that will make you giggle when I wag it.It is mostly black with the tip white. She is one of three girls in this litter of five Her adult weight estimated 10 lbs..
SOLD! Safari Brindle White Female CKC Shorkipoo Says Pick Me I’m The One For You! My new name is Mila and my new home is Bartow, FL. She is absolutely just look at her Gorgeous brindle white color , Oh don’t forget my adorable docked tail that will make you giggle when I wag it. She is one of four girls in this litter of six Her adult weight estimated 10 lbs..
SOLD! 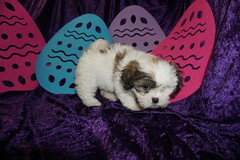 Scruffy Male CKC Shorkipoo Gorgeous Parti Color and A Gorgeous Docked Tail! Waiting on my new name and my new home is Sarasota, FL. He is absolutely just look at his Gorgeous Parti color! Oh and the cutest dock tail ever! He is one of two boys in this litter of six His adult weight estimated 10 lbs..
HAS DEPOSIT! Sabrina Brindle Female CKC Shorkipoo Says Let Good Times Begine! She is a precious, perfect puppy! Meet Sabrina. She is the lifelong companion you’ve been looking for. She loves to be held and spoiled. When arriving to her new home, Sabrina comes with a lifetime of puppy love and affection. After a long day at work, this cutie will surely make your day with all her puppy kisses waiting at the door. Sabrina loves to cuddle and just relax while getting her belly rubbed. Hurry! She can’t wait to start sharing her love with her new family! Waiting on my new name and my new home is Spartanburg, SC. She is absolutely just look at her Gorgeous brindle color that will probably lighten up as the weeks go by and the cutest docked tail that will make you giggle when I wag it.She is one of four girls in this litter of six Her adult weight estimated 8-10 lbs..
HAS DEPOSIT! 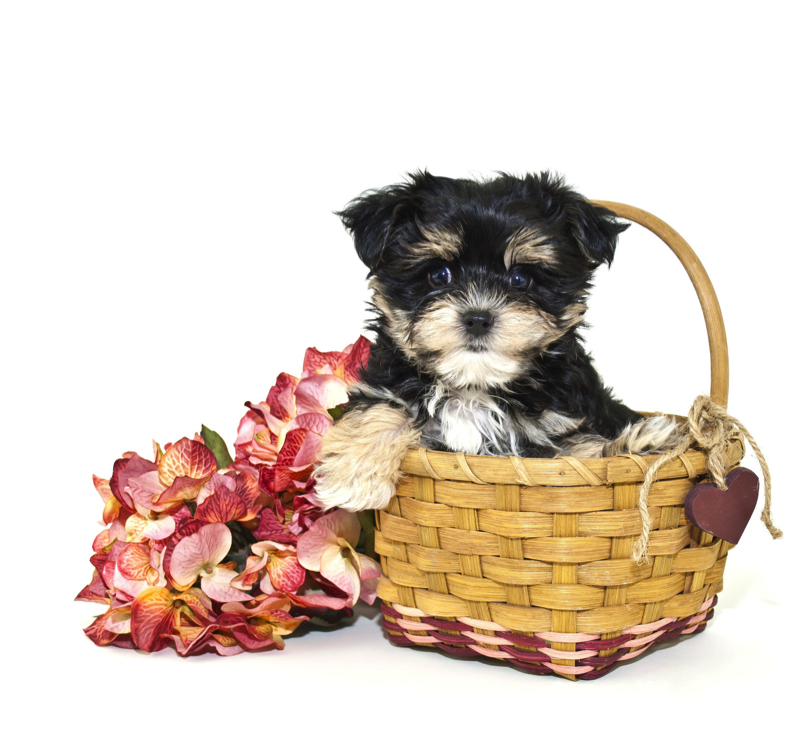 Sheba Parti color Female CKC Shorkipoo Is Ready To Give You A Lifetime Of Love!! “My name is Sheba and I have been dreaming of the perfect family. I think I have it really narrowed down by now. They’d like to spend lots of time snuggling and getting puppy kissest. Having fun is very, very important. They would also like yummy food after all grandma says I’m just a sweet thing with multiple layers of goodness . The more puppy treats they’d be willing to give me, the better. My perfect family would also like to take a nap every now and then. That way, we can recharge and be ready for more fun later on. Most importantly, they would be ready to love a puppy like me. I want to be everything that you could dream of in a puppy if you just give me that chance. I hope to hear from my perfect family soon! I know they are out there! HAS DEPOSIT: CONGRATULATIONS FREEMON FAMILY! Waiting on my new name and my new home is Newnan, GA.
She is absolutely just look at her Gorgeous pareti color that is white black and gold highlights. . Oh don’t forget my adorable full tail that will make you giggle when I wag it.She is one of four girls in this litter of six Her adult weight estimated 10 lbs..
HAS DEPOSIT! Snuggles Male CKC Shorkipoo Says Lets Have Some Snuggle Time!! If you’re looking for a pup that’s happy and content to just be with their family, then Snuggles is just the one for you! Whether it’s sitting on the couch watching television or going out in the yard for some games, Snuggles is right there at your side, tail wagging all the time! He is a super sweet, little guy that is very affectionate and loving! He is such a doll, and is ready to be your newest family member! Give us a call now to make this sweet baby all yours! He is absolutely just look at his Gorgeous brindle white coloring. Oh and the cutest dock tail ever! He is one of two boys in this litter of six His adult weight estimated 10 lbs..
HAS DEPOSIT! Sadie Says Let’s Have The A Wonderful Life Starting Today! Sadie is a very sweet baby girl that is very outgoing and loves everyone she meets. She is a very playful little girl, but she also likes to relax and be held. She is an absolutely adorable puppy. She has lots of puppy kisses and loves to give them out. Make Sadie yours today! You can’t go wrong with a pup like this! What more could you ask for? Whether playing dress up with the kids or lounging on the couch with you, Sadie will surely make your family complete! Waiting on my new name and my new home is Sanford, FL. She is absolutely just look at her Gorgeous brindle color that will probably lighten up as the weeks go by and a small white tip on her right back paw. Oh don’t forget my adorable docked tail that will make you giggle when I wag it.She is one of four girls in this litter of six Her adult weight estimated 10 lbs..
Meet Sofie! She is a perfectly perky little girl! She has such a fun spirit that she must get from her dad, who is a silly boy! She adores time spent romping on the floor with her toys, but her favorite place to be is beside you! Sofie is a really great gal and she’ll make a terrific pet! But of course her favorite time is snuggle time she says lets pop the popcorn and snuggle up for special time together. She is one of two girls in her litter. My new name is Rizzi and my new home Springfield, IL. Sofie is such a beautiful red brindle coloring of silky soft enticing you to run your fingers through it. She has the cutest baby doll face such an adorable Shorkipoo baby girl! She also has the cutest docked tail. Call today because she won’t last long. When you are in the presence of Sidney, you are in the overwhelming presence of beauty and class. Whether he’s on the silver screen or stage, all eyes hone in on him. This adorable baby boy has to have it all style and love that’s all his own. He will captivate you with just one glance. Put in your claim on this classic beauty soon, before he stars on someone else’s screen. My new name is Kirby and my new home is Fleming Island, FL. Sidney is such a White male with chocolate coloring on his face and at base of his tail. His hair is silky soft enticing you to run your fingers through it. He has the cutest teddy bear face such an cute Shorkipoo baby boy! Call today because he won’t last long. How can you say no to this baby face? Sylvester is just as silly as they come. He is always trying to catch your eye with his puppy tricks. He will surely be the talk of your town, and he is just waiting for that perfect family to call his own. And fear Sylvester will always have plenty of puppy kisses for you. Don’t let this baby boy pass you by. He will be that perfect, fun-loving addition that you have been looking for. SYLVESTER is such a gorgeous gold red color whom hair is silky soft enticing you to run your fingers through it. He has the cutest teddy bear face such an cute Shorkipoo baby boy! Call today because he won’t last long. Ready to know what puppy love really is? Then meet Sadie! This gorgeous girl will steal your heart the moment you meet her. She is that great companion that everyone wants. Sadie will come with a lifetime of puppy kisses. She’s ready to play, but most importantly ready to love you always and unconditionally. This beauty truly is a special girl, so don’t let her slip by. A lifetime of wonderful memories is waiting for you! My new name is Aiko and my new home is Austin, TX. Sadie is such a beautiful Yorkie coloring of Black brindle whom hair is silky soft enticing you to run your fingers through it. She has the cutest baby doll face such an adorable Shorkipoo baby girl! She also has the cutest docked tail. Call today because she won’t last long. “You are the one that I have been looking for. Let me introduce myself; my name is Giselle after the movie The Enchanted. It’s a perfect name for me because I am so beautiful and you can’t help but love me! I have heard a lot about how kind and loving my new family will be and I just can’t wait to get to them. I really hope it’s you because you seem to be everything I want. I’m cuddly, friendly, and come to you well mannered and healthy! I really hope that you call about me soon because you are everything that I have been dreaming of. Are you surprised a puppy is talking to you well grandma says I’m so smart I can tell you why I am the one for you. Hey I am praying you really see I am the little girl for you. Giselle is such a beautiful brindle chocolate color whom hair is silky soft enticing you to run your fingers through it. She has the cutest baby doll face such an adorable Shorkipoo baby girl! She also has the cutest docked tail. This litter name theme is Disney movie The Enchanted Call today because she won’t last long. “My name is Prince Edward! The Movie Enchanted is the theme of my litter. Am I not the cutest male Shorkipoo puppy you’ve ever seen? That’s what everyone keeps telling me. And not only am I cute, but I have a great personality too. I love to be around people and you will definitely enjoy being with me! I am a gorgeous solid rich black color that you will love to run your fingers through. I will make the perfect best friend and companion! So what are you waiting for? Choose me today! Prince Edward will not disappointment you as he is a gorgeous black with chocolate tint color whom hair is silky soft enticing you to run your fingers through it. He is the cutest baby boy with such an adorable face! He has his tail. This litter name theme is Disney movie The Enchanted Call today because he won’t last long. “Are you looking for the best puppy ever? Well, you found me! My name is Phoebe and I am the best! How do I know? Well, just look at me. Aren’t I adorable? I have the sweetest face making me not only cute but a people stopper everywhere I go. Grandma makes sure I come to you healthy too! I promise to be on my best behavior when I’m with my new family. I will listen carefully when you’re talking or teaching me and I’m well socialized. I’m just a bundle of joy to have around. So hurry and pick me to show off what an excellent puppy you have! Keeping my new name Phoebe and my new home is Cuba. Phoebe will not be a disappointment as she is a gorgeous black with chocolate tint color whom hair is silky soft enticing you to run your fingers through it. She has the cutest baby doll face such an adorable Shorkipoo baby girl! She has the cutest docked tail. This litter name theme is Disney movie Call today because she won’t last long.